Advanced Illness Care is a home based program for patients with UPMC Health Plan coverage who have a serious or advanced illness. It is designed to help patients better cope with their illness and maintain the highest quality of life possible. At the heart of the program is a team of social workers, Certified Registered Nurse Practitioners (CRNPs), and nurses who visit the patient at home. These experts partner closely with family members and primary care providers. The team helps the patient with advance care planning, achieving individual goals of care, and decision making in tandem with his or her PCP. It’s the power of face-to-face, collaborative care — delivered to patients in the comfort of their home. 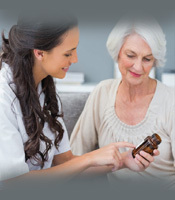 What does the Advanced Illness Care program offer? The Advanced Illness Care team includes UPMC Health Plan Medical Director oversight, and is further supported by a pharmacist. For more information about the Advanced Illness Care program, or to refer a patient, call 1-800-493-3760 or email the UPMC Health Plan.